When Pru Marlowe gets the call that there's been a cat shooting, she's furious. Animal brutality is one thing that this tough animal psychic won't stand for, and in her role as a behaviorist, she's determined to care for the traumatized pet. But when Pru finds out that it was the cat who did the shooting-accidentally setting off a rare dueling pistol-she realizes something else is going on. Could the white Persian really have killed her owner, or did the whole bloody mess have something to do with one pricey collectible? With the white cat turning a deaf ear to her questions, Pru must tune in to Beauville's other pampered residents, from the dead man's elite social set to their equally spoiled pets, to learn the truth, before her ex, a former New York cop, gets too close. 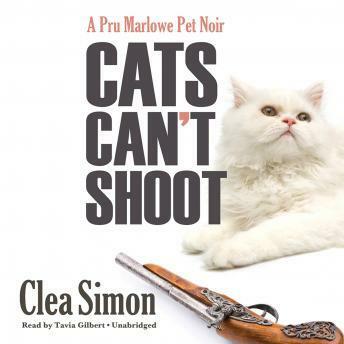 In a world where value is determined by a price tag, the pedigreed puss may have a reason for revenge, and only Pru Marlowe and her trusty tabby, Wallis, can figure out whether this was a case of feline felony or if some human has set up the Persian as the ultimate cat's-paw.